All Eucomis have an unusual somewhat exotic appearance: the flower is formed by a spike of masses of little flowers or florets topped with a tuft of green (reminiscent of pineapple plants). The large broad foliage is soft-textured and wavy edged. Their look and soft pleasing color make them good border plants for the late Summer garden. Bees love eucomis nectar. This is a lower growing species with dainty small white flowers. After pollination the flowers turn green and remain decorative into the Fall-season. In borders, beds and in pots and (mixed) containers. From the mountaineous areas of South Africa. 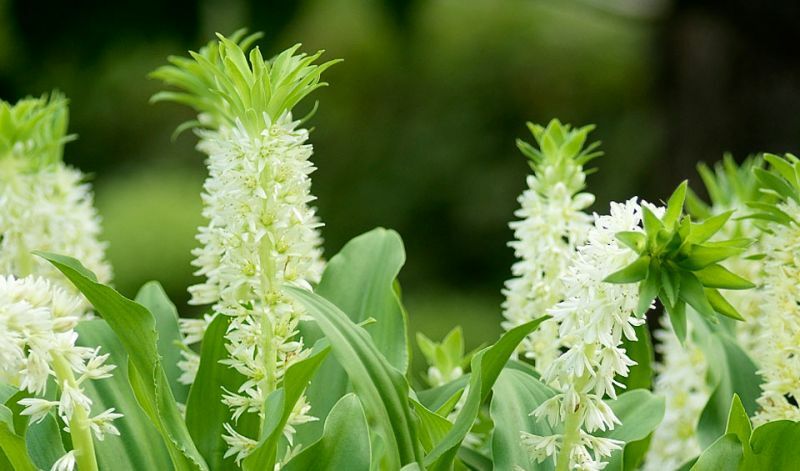 The name Eucomis comes from Greek: 'eu' meaning 'pleasing' and 'kome' meaning 'hair of the head' thus referring to the tuft of leaf-like bracts that crown the flower.